Puppy mills will breed a female dog every time she is in heat. For instance, a 5 year old dog could have given birth to 10 litters of puppies. In puppy mills, animals can spend most of their lives in cramped cages, with no room to play or exercise. Often the water and food provided to puppies is contaminated, crawling with bugs. Puppies can even be malnourished. Puppies in mills are found with bleeding or swollen paws due to spending their lives on wire floors, severe tooth decay, ear infections, dehydration, and lesions on their eyes, which often lead to blindness. Almost all pet store animals come from puppy mills. At the time of purchase, consumers are given incorrect information about the dog’s health, the breed and the breeder. Every year, retail pet stores across South Africa sell thouands of dogs, while millions of dogs enter shelters. Most puppy mills have no veterinary care, climate control, or protection against the weather. With limited or no regulations or enforcement, puppy mills have no cleanup control. This means that dogs can be living in their own urine and feces for indefinite periods of time. Puppy mills are legal. 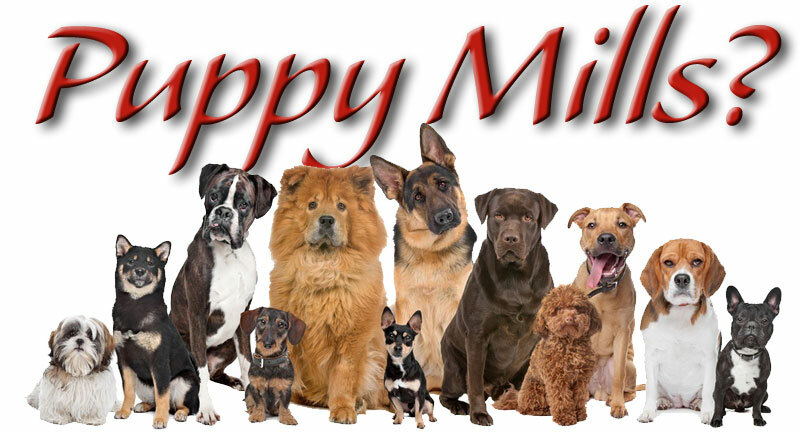 It is important that future pet owners should seek rescue dogs from their local shelter or buy pets from a trusted breeder in order to put mills out of business. Only knowledgeable licensed breeders adhering to breed standards should be allowed to breed and sell animals. They should be compelled by law to check the credentials and premises of prospective owners, as is the practice of the SPCA and most animal welfare organisations. Breeding practices, premises and health-care should be strictly cosntrolled by independent inspectors comprised of members of various established animal welfare groups with an intimate knowledge of the various breeds, not by government appointed inspectors. The inspectors should be empowered to levy fines or impose bans for transgressions. Pet stores should be allowed a commission for assisting in the homing of unwanted or stray dogs from animal shelters, but not allowed to keep any animals in their stores. Home checks should be conducted by shelter officials. We are making a concerted effort to bring the cruel and heartless industry of puppy mills and backyard breeders to the attention of the general public as well as decision makers. This is not a quick-fix; it will take time and a sustained effort to have the sale of live animals in petshops banned. While working towards having the laws changed, we engage in protest action, public awareness campaigns through websites and the social media, educational street "happenings" and mass mailings. Beauty Without Cruelity (BWC) is engaged in rolling protest action at petshops known to support puppy mills and backyard breeders as well as at shops suspected of animal abuse. See their website and facebook pages. Fur Free SA support the BWC initiative and calls on its members to support the protests. See their website at www.furfree.net as well as its Facebook page. Speak! (Society for People, Environment and Animal Kindness) is launching street "happenings" in centres and shopping malls throughout Gauteng. See their website for more details. We are also supported by various animal welfare groups. To see videos of all demonstrations by BWC, Fur Free and The Seals of Nam, go to the VeryVegan You Tube website. Become an Activist for Kindness and Justice! If you would be willing to support our cause, mail us at stop@puppymills.co.za and we will add you to our database and notify you when we need your support for our mailing campaigns. We will also notify you of future events and happenings, and will update on any progress. Your e-mail address will not be made public and your privacy will be respected. SPREAD THE WORD - Adopt dont Shop! We endeavour to educate the public on various issues of concern relating to our mission. We are now staging guerrilla theatre performances in support of Beauty Without Cruelty’s ‘Puppy Mill’ campaign, which is aimed at having the law on the sale of animals in petshops changed and putting a stop to the backyard breeding of animals. At the moment we are focussing on dogs bred for petshps. We intend to turn our attention to other areas of concern at a later stage.